This Premium high tenacity Polypropylene (Pylon) netting offers the most longevity and durability. Pylon netting is ideal for high impact applications. 3.0mm has a 250# break strength and is available in 1-1/2” White or 1-3/4” Black. 3.5 mm has a 325# break strength and is available in 1-3/4” White. Netting is treated and extruded through the fibers for maximum weather and UV resistance. Netting can be finished with a rope or vinyl border. A rope border offers a simple and easy installation. 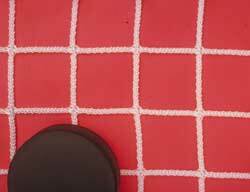 The Vinyl edging provides the netting with added strength while keeping the nets shape. The reinforced, double stitched vinyl also gives the net a sharp appearance. Optional brass grommets can be added and are placed every 18”. Please contact me with more information about: "Pylon 3.0mm Knotless 1-1/2" SQ Mesh White Netting, Tape Bound w/Grommets".